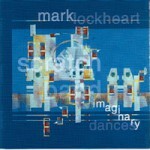 “IMAGINARY DANCES” is the second album by Mark Lockheart & his 11 piece Scratch Band. This is the eagerly awaited follow-up to his critically acclaimed first album, “Through Rose-Coloured Glasses” released in 1998 – one of Time Out critic John Lewis’s “top ten albums of 1998”. This album was based on compositions written after being awarded the Peter Whittingham Award for composition in 1997. Marks new album “IMAGINARY DANCES” again features the Scratch Band and is an ambitious tour de force ranging from symphonic epics to tender duets. This is a mature album from a writer who is rapidly propelling himself to the forefront of UK jazz composers. Mark currently also plays in John Parricelli’s band & new young lions of the London scene Polar Bear. His past associations include Billy Jenkins & Annie Whitehead. Mark has also contributed to many pop sessions including Radiohead. Robert Wyatt, Jah Wobble, June Tabor & Prefab Sprout. He also plays in the Roger Beaujolais Quintet & Vibraphonic. Produced & arranged by Mark Lockheart, “IMAGINARY DANCES” was released March 2002 on StayTuned Records.